Complete sales and opportunity management tools to help grow your business and the best part of all - it will cost you nothing! Create your own sales stages and progress each opportunity through the sales funnel and see where everything is at a glance. 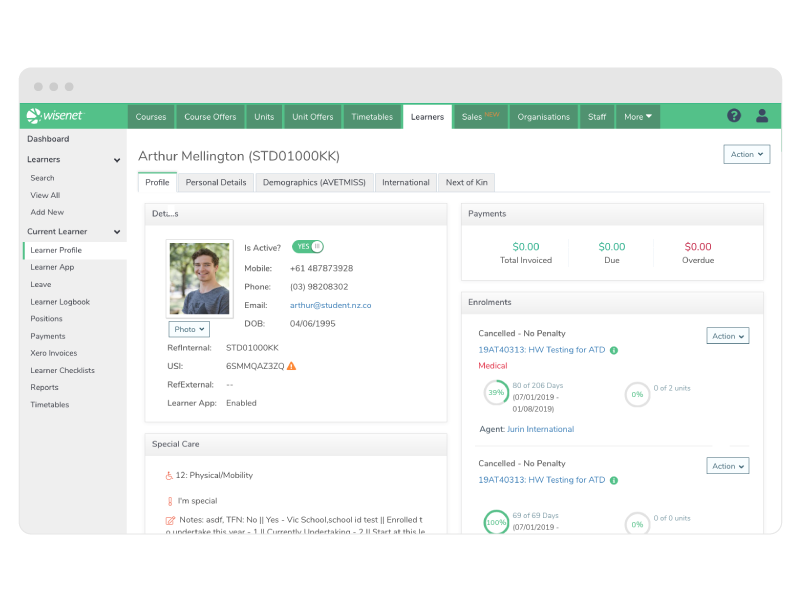 Track enrolment and sales performance with reports and dashboards for better forecasting and decision making. See all sales activity at any time in one place and eliminate individual spreadsheets and inaccurate data. Define custom tags to group contacts and create lists for more accurate and meaningful communications. Capture every email, conversation or document against each Contact's Logbook. See all events in chronological order making it easy to pick up where you left off. Say good-bye to lost emails with built-in messaging and tasks stored neatly against each individual contact's record. Want to take things to the next level? We're ready when you are. Combining Wisenet CRM with Wisenet Learning Relationship Management (LRM) gives you the ONLY complete end-to-end learning management platform on the market. Provide your learners with a first class journey from their initial point of enquiry right through to graduation with leading integrated applications, automation and workflow tools. Manage courses, enrolments, compliance, sales, finance & e-learning. Dedicate more time to ensuring learner success rather then managing data. Let Wisenet LRM do the heavy lifting to automate your manual processes and manage compliance with a more intuitive, clear and easy to use interface.